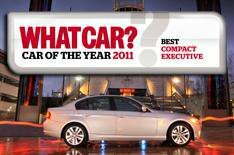 Compact executive winner | What Car? There's no need for a drumroll or an X Factor-style dramatic pause. When all three of our finalists come from the same model range, theres only going to be one winner. The simple fact is this: however much youre spending on your compact executive, the BMW 3 Series is your best option. The car is now six years old, but its had various engine, suspension and styling tweaks along the way, so it still leads the class in almost every area. In many of those areas, it leads by no small margin. That is the mark of a truly great car. For us, the best all-rounder is the 320d ES. The 181bhp four-cylinder turbodiesel engine provides all the punch youll ever need, and its as flexible as it is powerful. Even more impressive is the way BMW combines this with class-leading figures for emissions and fuel consumption, which means more affordable running costs than for any competitor. What we really love about the 3 Series, though, is its ability to make you smile every day. Yes, the ride has a firm edge, but its never harsh or uncomfortable, and its well worth living with the firmness for the strong body control you get in return. Its complemented by sensational grip, wonderful balance and sharp, feelsome steering, so the 3 Series will make mincemeat of any country lane. If youre looking for sheer driving pleasure, none of the BMWs rivals can get anywhere near it. It has the edge on the rest for quality, too. Every surface you come into contact with is made from dense, appealing materials, and the standard of the assembly is verging on flawless. You get a feeling of classiness the second you climb in, and thats exactly what a BMW should deliver. Your passengers are equally well catered for. Theres bags of interior space for four tall adults, and although the boot isnt an ideal shape, it lacks nothing in volume. ES trim isnt the most luxurious on offer, but its affordable and it provides all the equipment you need, too, including air-conditioning, alloy wheels, four electric windows and a host of safety aids. In short, the 320d is all the car most people will ever need, and although its a prestige product, it wont cost the earth to buy or run.